Apple has launched a digital subscription service for publishers to collect recurring payments on magazines, newspapers, music and video services. 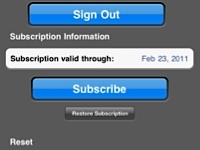 Subscriptions was first introduced with The Daily newspaper app. “All we require is that, if a publisher is making a subscription offer outside of the app, the same (or better) offer be made inside the app, so that customers can easily subscribe with one-click right in the app.” Said Steve Jobs, Apple’s CEO.